The First Runner Up for Best Bar Burger after tasting close to 70 different variations in restaurants comes from a haunt that is know for serving one of the best hot dogs in these parts. But as I stood in line one day I saw a little sign for “The Natural” and decided to give it a shot. And boy was I pleasantly surprised, it was absolutely delicious. The “Natural” burger was 6 ounces of delicious chuck and sirloin from Newtown’s Butcher’s Best Market. Owners Gary Zemola, John & Lorin Pellegrino created a very distinct flavor in the meat and the kitchen perfectly seasoned the patty. It was served on a bun from Chaves Bakery (plain or potato depending on the season) that allowed the flavor of the burger to shine. The grill-master cooked it to a perfect medium-rare. The bacon and cheese were excellent additions. You may also want to try one of Zemola’s house-made toppings (recipes are the same for over a decade) to add other great flavors and textures. 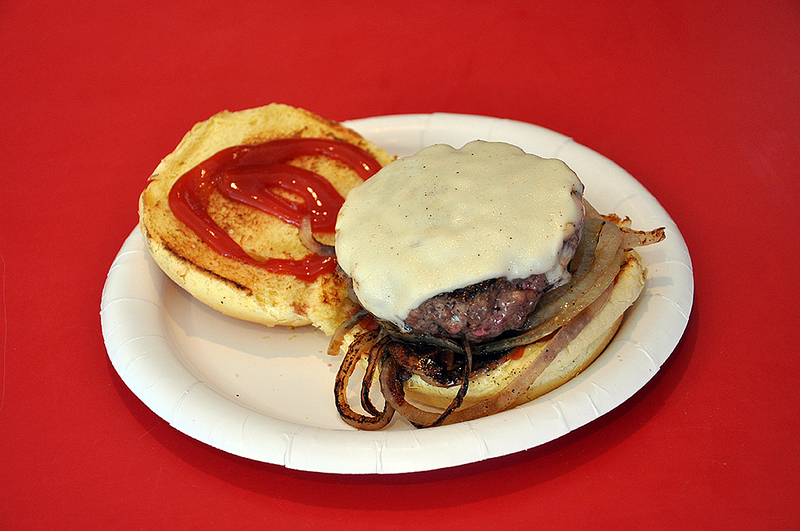 This entry was posted in Fairfield and tagged ctbites, Fairfield, hamburger, Jeff Schlesinger, jfood by jfoodeats. Bookmark the permalink.